This blog is about presenting thoughts around social business in a broad sense. But when Higher Logic comes out with resources that I think would be useful to anyone interested in private online communities, I'll be sharing them here. Case in point: the 2013 Higher Logic Engagement Success Kit. 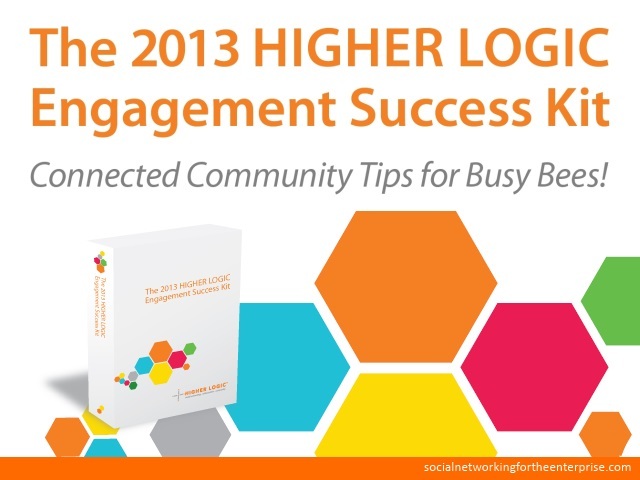 The 2013 Higher Logic Engagement Success Kit is a free online toolkit created for organizations looking to build community and provide a platform for collaboration. The kit features multiple volumes – each containing ten quick tips – organized and grouped by essential industry-specific keywords. We'll be launching one tip sheet each month, and the first two are available now: the Engagement Tip Sheet and the Membership Tip Sheet. Each tip sheet is more than a "sheet" - it's a toolkit containing 10 actionable tips that will help take your online community to the next level. While the success kits are designed primarily for Higher Logic clients, most of the tips can easily be adapted on other platforms. The first volume in the toolkit was the Engagement Tip Sheet, which features 10 quick tips to get community members engaged. Engagement ideas range from tweaks you can make to your online community to in-person event tie-ins that will hep engage community members offline. Download it today and start ramping up your online community engagement. The second volume is the Membership Tip Sheet, which focuses on retention, renewals and rewards. Component management, association management software (AMS) integration, demographic information--these topics and more are included in the Membership Tip Sheet. Coming next month: the Marketing Tip Sheet. Check back next month to download it and start planning your fall community marketing initiatives. Have tips you don't see included or that you think is too good not to share? Share your idea with Lauren (lauren@higherlogic.com), Higher Logic's Interactive Marketing & New Media Manager, and it could be included in an upcoming tip sheet.